The Metropolitan Centre will host an Open House to kick-off a series of upcoming events that will showcase the Regula Grand Ballroom and roof-top patio as an ideal venue for weddings, corporate events, and more. 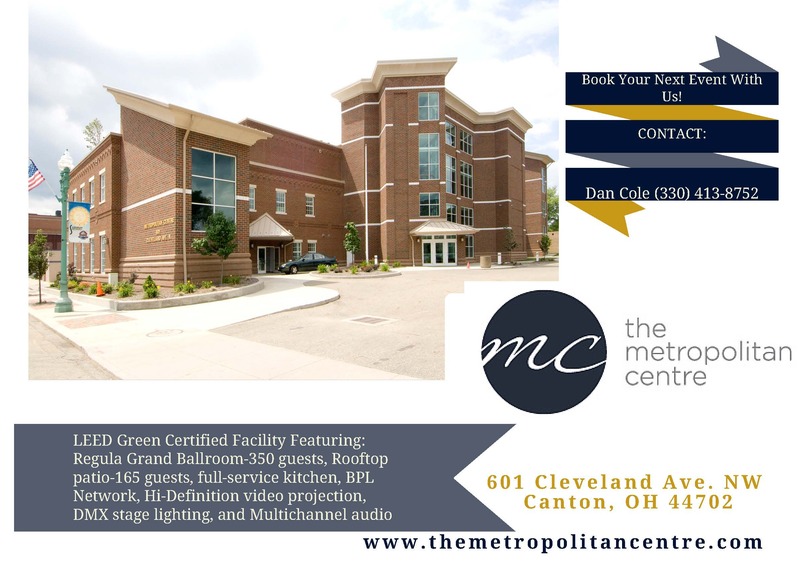 The free event is open to the public and will be held on Wednesday, September 9 from 5 p.m. to 8 p.m. at The Metropolitan Centre (601 Cleveland Ave. NW Canton, OH). The Open House features live music, door prizes, and food sampling from many of Stark County’s finest catering companies and restaurants. By public vote, winners of the food sampling challenge will be added to The Metropolitan Centre’s Preferred Vendor List. The Vendor Showcase will also include: photographers, decorators, florists, and a variety of wedding and party entertainment companies.